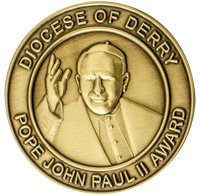 The Pope John Paul II Award is a faith achievement award for young people between the age of 16 and 18. It is non-competitive, inclusive, flexible and voluntary. The Award enables participants to take an active part in the life of their Church – in the life of their community and society. It enables young people become more aware of the teaching and role of the Catholic Church in the world and to engage at a deep level with Christ. 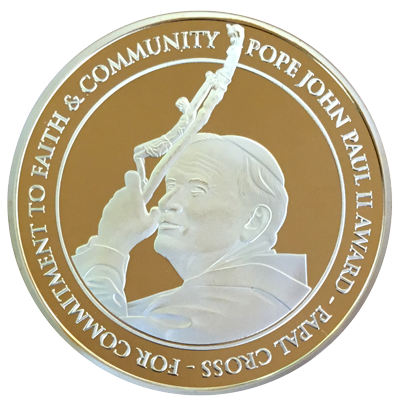 The Award was created to commemorate the late Pope John Paul II who was so committed to young people and who had such belief and confidence in them. The Award was launched by the Papal Nuncio to Ireland, His Excellency Most Rev Dr Giuseppe Lazzarotto on 7th November 2006 in the Diocese of Derry, Ireland. The Award is committed to helping young people enhance their spiritual, physical, emotional and social development through participation in school, parish and community activities. As well as the feeling of personal achievement that a participant will gain from taking part in the Award, participation will help demonstrate the young person’s commitment to a task and goal. The Award is non-competitive, flexible and voluntary and requires an ongoing commitment. Awards are earned by taking part in parish and social activities – 1 hour per week over 8, 14 or 20 weeks. There are 3 Awards – Gold, Silver & Bronze. Those that have completed the Gold Award have a further option of completing the Papal Cross Award. Awards are earned by taking part in parish and social activities – 1 hour per week over 8, 14 or 20 weeks. There are 3 Award levels – Gold, Silver & Bronze. Those that have completed the Gold Award have a further option of completing the Papal Cross Award. 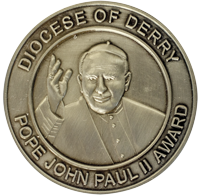 The Pope John Paul II Award is coordinated from its head office in Derry, Northern Ireland. It was created by Fr Paul Farren in his role as director of the Derry Diocesan Catechetical Centre. Since 2006 has been been running successfully in schools and parishes throughout Ireland and the UK. It is now been actively promoted in the United States. If your diocese is not listed as already running the Award, to establish it in your diocese will require the approval of the Award head office and your Diocesan Archbishop or Bishop. Contact your diocesan office directly and tell them about the Award. Once approved, the following structure will be required to be put in place to run the Award. Award Patron – The Diocese Bishop or Archbishop. 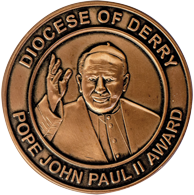 Award Making Body – Pope John Paul II Award Committee. Award Leaders – Parish Coordinators, School Coordinators. Facilitators – Those who will facilitate the Award to fulfil individual tasks/activities. Promoters – Clergy, Head Teachers, School Governors. Administrative Centre – Your Diocesan Office. Is my diocese running the Award? leading the Award in your parish or school. How do Schools and Parishes enrol in the Award?